MTD & CUB CADET BELT Fits MTD/ Cub Cadet/ White lawn/garden tractor auto drive (1999-) LT1018 (42",18.5 HP B&S ELS Hydro), 1180 (w/46" deck), 1212 (w/46" deck), 14AK13CK709 (54", 27 HP Kohler Hydro), 1600 (w/46" deck) and 1800 (w/46" deck). MTD/ Cub Cadet/ White riding lawn mower 600 series (46" deck), 700 series (46" deck) and 800 series (46" deck), application belt drive. 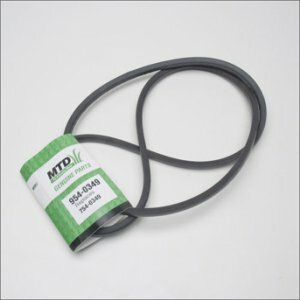 Replacement belt For MTD/CUB Cadet White 79" x 1/2"